The floating island launched into No Name Lake in November, 2016. Harmful algal blooms — the overgrowth of algae in water — are a major problem across the nation. Blooms occur when excess nutrients (nitrogen and phosphorus), combine with sunlight, and warm temperatures in water bodies. They can cause severe, negative impacts on aquatic ecosystems, the economy, and human health. EPA is working with Chemehuevi and Colorado River Indian Tribes to research ways to eliminate or reduce the negative effects of harmful algal blooms. 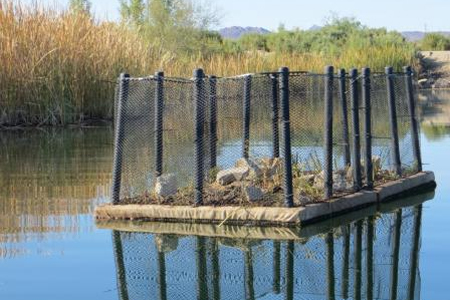 In an ongoing study, EPA and its tribal partners are evaluating the effectiveness of man-made floating vegetated islands to remove nutrients from the water along Lake Havasu and the Colorado River, within the tribes’ reservations. Floating islands are platforms that hold plants so that the roots can grow into the water and improve water quality. For the study, researchers wanted to determine if the plant populations native to the Lower Colorado River basin could be used on floating islands to absorb excess nutrients and reduce the occurrence of harmful algal blooms. To construct the floating islands, EPA relied on the Colorado River Indian Tribes and Chemehuevi Indian Tribe to provide their accumulated knowledge about essential plants used for food, cultural practices, and medicinal purposes within the Lower Colorado River basin. Environment staff from both tribes identified and collected culturally relevant plants — needle-spiked rush, gilia, and Parry's beargrass — and incorporated them into the design and construction of two 5’x10’ floating vegetation islands. The native species are known to absorb nutrients such as phosphorous and nitrogen and are adapted to the local ecosystem. EPA worked with each tribe to launch the islands in early 2017. The difference four months makes on the underside of the floating island. This shows a considerable increase of roots mass for the island plants. The difference four months makes on the underside of the floating island. This shows a considerable increase of roots mass for the island plants. Early monitoring has shown promise — researchers found that two months after launching, the floating vegetated islands reduced the nutrient concentration to a safe level. The study demonstrates the potential of using native plants and floating islands to reduce nutrients — useful tools in alleviating harmful algal blooms in water. EPA scientists plan to build on the promising results of the study. Future steps will include efforts to investigate the impact of increased floating island coverage and placement over the water surface, plant selection, and whether floating islands impact the natural flow of water through a landscape. The study provides one possible approach to address the threat of harmful algal blooms.